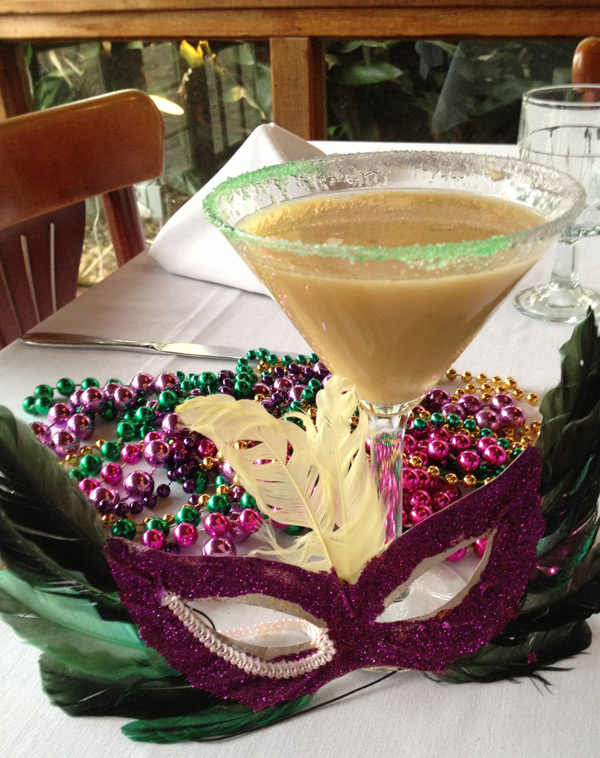 Plus cocktails, cupcakes, croissants and more as this Mardi Gras treat evolves from its humble roots. A round roll of cinnamon dough, sprinkled with icing and colored sugar and hiding a baby inside its folds, the official food of Mardi Gras used to be limited to the Gulf Coast. 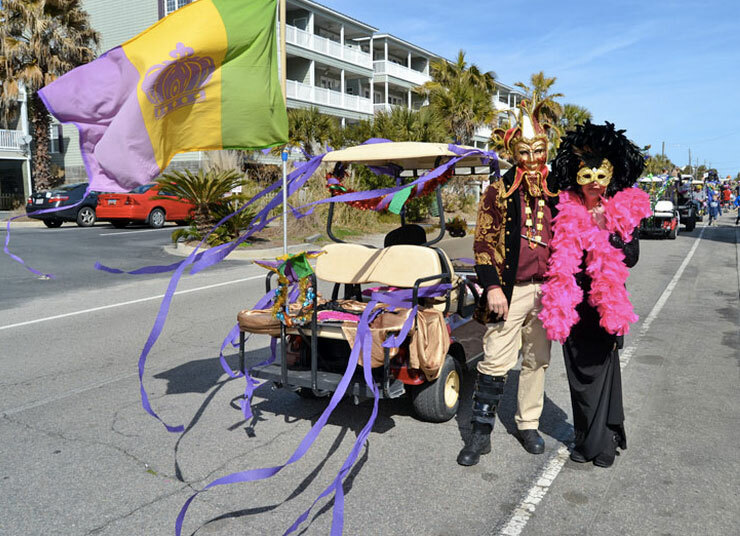 The tradition was brought to the area from French and Spanish settlers, and it’s said that King Cake parties during Carnival season dates back to the 18th century in Mobile, Alabama. Paul’s Pastry, a small bakery in Picayune, Mississippi, is credited with adding filling to the cakes. Today, fillings range from cinnamon sugar to cream cheese and a variety of fruits, with donut versions also finding their place on Mardi Gras tables. Just as the King Cake made its way from Europe over to the Deep South all those years ago, the sweet confection seems to be on the move again. And it’s no longer limited to cake. Tastes are available in everything from cocktail, cupcake, cookie and donut forms. Then there’s the French version called galette des rois with flaky layers of puff pastry and almond flavored filling, possibly the reason why if you spot a French bakery in another state, there’s a good chance you’ll find a King Cake inside these days. While the price is still steep to ship a King Cake from the New Orleans and South Louisiana area —$80 is the average rate for a cake and delivery — UPS stores have stepped up to make things easier. Select stores, including some in Lafayette and New Orleans, are taking orders themselves and will then work directly with a bakery to place and fill the order. Bakeries across the South are also trying their hand at the cake so that folks as far as the Carolinas can get a taste. Here’s our roundup of all the current iterations of the King Cake, where to find them and where to order your own cake before Mardi Gras. 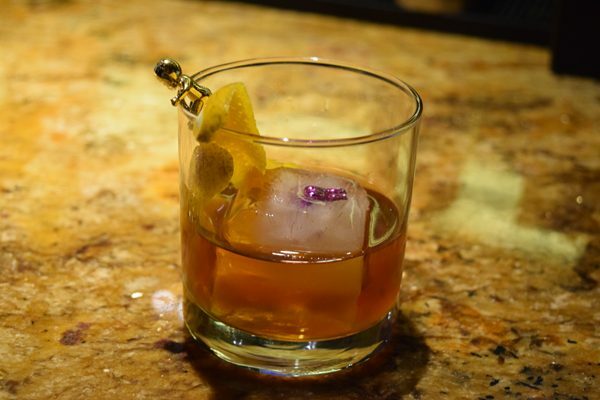 We have a King Cake Cocktail recipe from Bourbon House and a King Cake Old Fashioned recipe from SoBou in New Orleans for those who want to try their hand at home. At District Donuts in New Orleans and Baton Rouge, a croissant King Cake lightly spread with cream cheese filling and topped with salted caramel and pearl dragée is on the menu. Sophi P Cakes in Lafayette is offering King Cupcakes — yellow and cinnamon swirled cake with your choice of filling and topped with cream cheese icing and Mardi Gras sugars. The shop is also serving the King Cheesecake with layers of King Cake, filling and traditional cheesecake, iced in cream cheese and packed with King Cake crumbs and sprinkled with Mardi Gras sugars. The Boudin King Cake was first introduced in Lafayette as a partnership between Boudin Link and Twin’s Burgers & Sweets. The traditional round of breaded dough is filled with local boudin and topped with bits of cracklin and Steen’s Syrup. Read our tasting notes and see photos and video of the Boudin King Cake here. A search on Instagram of the hashtag #KingCake brings up more than 160,000 posts and some interesting iterations, like a Banana Foster King Cake from Nonna Randazzo’s Bakery in New Orleans and King Cake Ice Cream at Louisiana Reauxl in Lake Charles. For a liquid version, there’s the King Cake Vodka, which arrived on shelves in 2012 from Lucky Player Brands and is said to be based on a Haydel’s King Cake from New Orleans. And Community Coffee mades a Mardi Gras King Cake blend of cinnamon and vanilla flavors. A King Cake Festival is also scheduled for January 27, 2019, at Champions Square in New Orleans featuring cakes from some of the city’s best bakers. Ten tasting tickets cost $20. Ambrosia Bakery – This Baton Rouge favorite sells a traditional King Cake that ships undecorated to ensure freshness, meaning that you get to apply the icing and sugar once it arrives. Filled, pecan praline and a Zulu King Cake, named for the New Orleans krewe, are also available. Prices range from $12.95-$34.95 with shipping running $40. Haydel’s Bakery – This favorite New Orleans bakery has many versions of the King Cake to choose from, whether you’re looking for a mini cake, one in the shape of a fleur de lis or a Queen of Carnival Package. Prices range from $44-$60, not including shipping. Julie Ann’s – For folks in North Louisiana, this Shreveport bakery is the go-to for King Cakes. Prices range from $19.99-$72.99 depending on size and filling, not including shipping. Call 318-424-4996 to order. Keller’s Bakery – A favorite of Deep South, this Lafayette bakery makes a coffee cake style version (pictured) with the perfect amount of icing and filling (along with Mardi Gras-themed petit fours). Prices range from $13-$56 depending on what size you order, and shipping is available by calling 337-235-1568. Manny Randazzo’s – A second-generation baker with a family King Cake recipe that’s arguably one of the best around New Orleans, this shop’s King Cake packages include a decorative UPS shipping box, doubloons, beads, history of the King Cake and a Mardi Gras Cup. Prices range from $55.95 to $85.95 and include shipping. 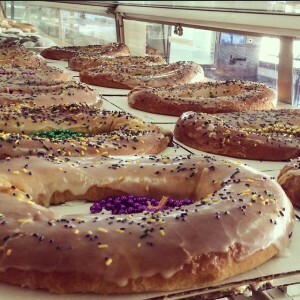 Meche’s Donut King – Donut King Cakes aren’t for everyone, but they do have their die-hard fans. Meche’s are $36.95 with your choice of fillings, but shipping can be around $50 for two-day. UPS stores in Lafayette have partnered with Meche’s to ship their cakes, and select stores will place and fill the order for you. 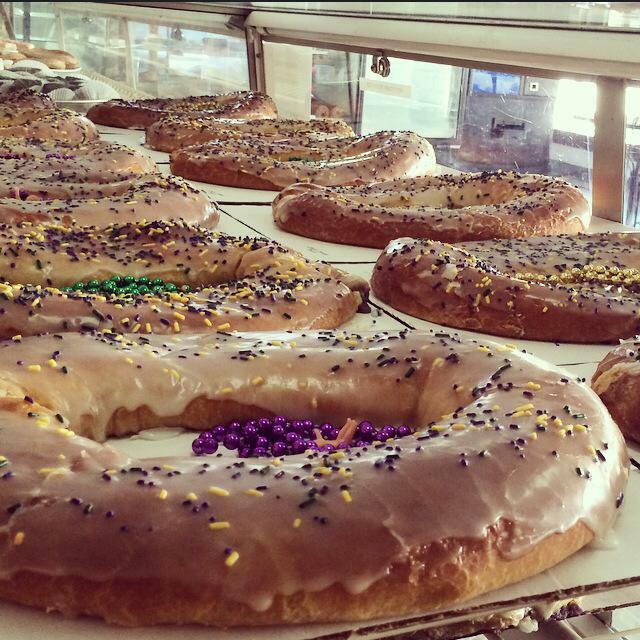 Paul’s Pastry Shop – Credited with being first to “fill” a King Cake, this staple in Picayune, Mississippi, sells King Cakes online year-round in more than 20 flavors. Medium cakes are $53.95 and large $63.95, including shipping. 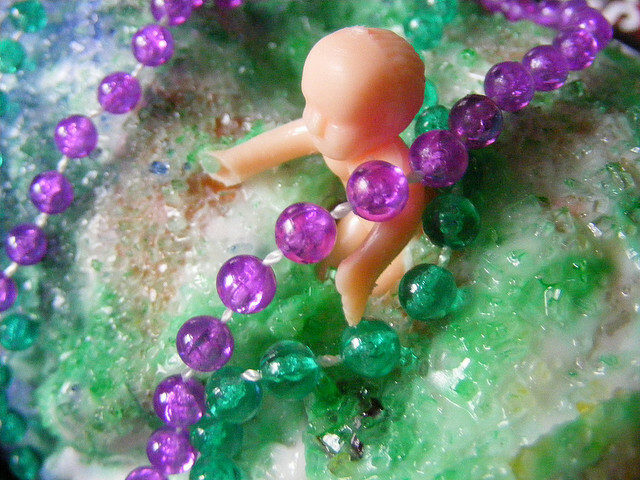 Mardi Gras souvenirs, from King Cake babies to beads, masks and doubloons are also available for purchase. Paul’s cakes are sold throughout Mississippi, Alabama and into Florida and Louisiana as well. See the full list of locations here. Poupart Bakery – The traditional French King Cake, or galette des rois, made of round puff pastry and filled with almond marzipan, can be found at this Lafayette bakery, along with the traditional American version. Prices range from $59-$69 and include shipping. Rouses – This Gulf Coast grocery store has several King Cake Packages, starting with the Economy for $36.99 all the way up to Deluxe for $48.99. Fillings are an extra $5. Their two-day shipping is free for most of the South, so this may be the best deal, with shipping for overnight priced at $9 and $11. Sucre – This popular Magazine Street Bakery is famous for its macarons, which do come in a Carnival Collection for $60, but Sucre’s King Cakes are also available for $24 each, not including shipping. If you’re a King Cake novice, you’ll want to be aware that there’s probably a plastic baby baked into your cake. Part of the tradition and representing the Baby Jesus, the baby in the cake determines who’s responsible for buying the next one. If you find one in your slice, we advise fessing up and placing an order at one of the bakeries above. 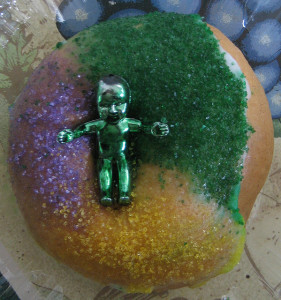 Photo credits, from top: Featured photo by John W. Schulze on Flickr Creative Commons, cocktail courtesy of Cafe Vermilionville, bagel King Cake by Infrogmation of New Orleans on Fickr Creative Commons, Keller’s King Cakes from Keller’s Facebook page and King Cake baby by Deep South. You did not mention one of the best…..
Twice…..been serving the Pine Belt over 30 years. Thanks, wasn’t aware of Jody’s! Paul”s is Great! Awesome fillings. Fresh, tender. You must have some vendetta to say such a false claim.